One of the four Hundreds of the old county of Huntingdonshire, the name derives from “Norsemen’s Cross”. It is famous for being the site of a Napoleonic Wars prisoner of war camp – the Norman Cross Depot. The 43-acre camp was located in the north-east angle formed by the A1(M) and the A15 to Peterborough. Its outline is still visible from the air. The prefabricated wooden barracks and the camp’s equipment were disposed of by auction when the camp was decommissioned, but the Commandant’s handsome Georgian house still stands. During the camp’s working life from 1797 to 1814, up to 7000 French, Dutch and German prisoners were kept here, guarded by a militia detachment. Officer prisoners were permitted to live outside the camp, on ‘parole’ – their word of honour. A few were known to have lived in Stilton. One prisoner, a French fisherman named Jean Habert, worked as a baker in the camp and fell in love with a local girl, Elizabeth Snow, who delivered milk to the camp. When offered his release in 1810 he requested permission to remain, married Elizabeth and settled in Stilton. Here he established himself in business as a baker, corn merchant and innkeeper of the Talbot. He and Elizabeth had nine children, who made happy and prosperous lives locally. Jean, Elizabeth and some of their descendants are buried in St Mary Magdalene’s churchyard. The prisoners were well treated by the standards of the time, (faring better than many poor Englishmen in fact) but, sadly, some 1700 men died here, most during a typhus outbreak. They were buried nearby and, in 1914, a memorial column was erected beside the A1. In 1990, the column was pulled down by thieves who stole the bronze Napoleonic eagle. This desecration prompted the forming of the Friends of Norman Cross, who launched an appeal, resulting in the replacement of the eagle in a more suitable position. 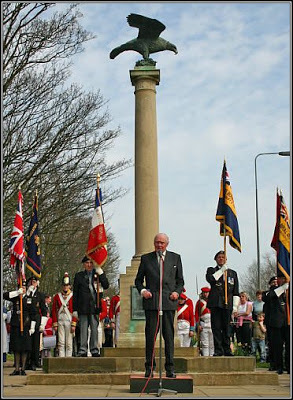 The Duke of Wellington unveils the memorial eagle, April 2005. In July 2009, the Time Team archaeological TV programme carried out excavations and unearthed a wealth of evidence about life at the Depot. Peterborough Museum has an impressive collection of scrimshaw (bonework) and straw marquetry made by the prisoners, which they were allowed to sell at the prison gate in return for money and small luxuries. For a comprehensive history of the Depot, please visit the Friends of Norman Cross website.